Today’s Gospel reading is a bit strange. First we get this beautiful image about how the kingdom of God is like a field, in which a farmer intends to grow good seed, but an enemy disturbs this plan by planting weeds among the good plants… and then Jesus does this sharp left turn and starts talking about the mustard bush and some birds making nests in it and then he makes another sharp turn an tells about a woman mixing yeast and flour to make bread, and then finally he does a complete U turn and returns to the original story to explain its meaning to His disciples. 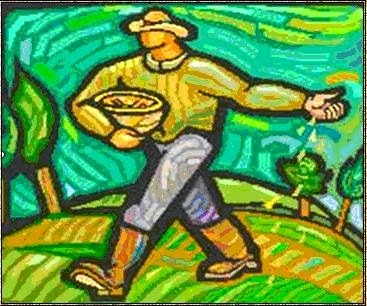 One might think that when St Mathew was writing his gospel he could not find a good place for these two extra stories so he threw them right in the middle of the Good Sower parable, hopping that some day some poor deacon could make sense of it all. But I think this type of view for this Gospel reading is a bit…I don’t know…shallow? The reality is that these three stories, as confusing as they might look, appear together in this gospel for a very good reason. Because this is the way the Holy Spirit uses to force us to reflect on the big ideas of Jesus’ message, ideas which will challenge us, the ones who require effort and commitment on our part. Let me show you what I mean: The first thing to notice is that all three of these parables are that they have a common theme: growth; a growing field, a growing bush, growing bread. The first parable is obviously the most important, since it is the only one which is explained by the Lord. In it we are instructed to the incredible ability the Kingdom of God has to grow, even when it is surrounded by enemies, enemies bent into destroying it. Now if you think about it, we, the disciples of the Lord are the ones who have been given the charge of growing as this kingdom. Jesus says very clear that the field is the world, and we are the good seed planted in it. The attitude of the servants in the story reflects the natural human desire to do things the easy way. It is true that we would much rather build the Kingdom of God without having to deal with any troubles. But, I don’t need to tell you that trouble is the one thing we cannot avoid. There are many Catholics who waist no opportunity to ignore and criticize the actions and the teachings of our Church. The natural tendency would be to remove these from the picture so that we can have a nice little kingdom all for ourselves. But this is not God’s plan for us. God’s plan, which is given in the second parable, is to grow His kingdom from a small band of fisherman into what we are today, and what we will continue to be until the day the Good Lord returns to us: the voice of the needy, the weak and those society wants to eliminate because they are inconvenient, the largest charitable institution in the world, home of saints and sinners. The attitude of the Master in the parable tells us what our own attitude should be: Ignore the bad seeds, eventually they will receive what they deserve; concentrate in growing the kingdom. How? To borrow a phrase from one of my kids “By mixing it up”. We are called to be the yeast which mixes with the flour the world. Now I know for a fact that here at St Michael we have a lot of good bakers. I also know that if you want to make really good bread you have to mix the yeast in with the flour. This is not what you would call a “gentle process” There is a lot of hitting and pushing, and then there is some waiting and them some more knotting and hitting a bit more until the mass is ready to rise. To make a good loaf of bread first you really need be manhandled. This is the image our Lord Jesus wants to place in our minds; to help us understand how are we to build the Kingdom Of God. It is not by staying in our own little world, but by getting out there, where we can encounter those who like flour have not reached their full potential until they are mixed with us. It is not going to be easy, we are going to encounter push back and hostility. I wish I could tell you differently, but to grow as the Kingdom of God, requires sacrifice. Which brings me to my last point. Today’s reading ends with a warning to evil dowers and to those who cause others to sin, a warning them about their eternal destiny. But it also ends with a promise to those who hold unit the end, to the ones willing to grow the kingdom among the weeds. Those will shine as bright as the Sun. Like I said at the beginning, today’s message require careful consideration. How am I growing the Kingdom of God and what can I do to be the yeast to the flour of our culture and our society? That is a question each one of us has to answer by ourselves. Today during communion let us ask to the Holy Spirit to guide us and show us the best way to grow, right where we have been planted. Amen?